Word and Witness, published by E. N. Bell, served as the primary periodical of the Church of God in Christ (sometimes referred to as Church of God in Christ [white] to distinguish it from Bishop Charles H. Mason's largely-African-American organization with the same name). Most members of the Church of God in Christ (white) were located in the South and initially consisted of ministers who held credentials with Charles Parham's Apostolic Faith Movement. Sometime after mid-1907, this group of ministers left Parham to form their own organization. The new organization continued using the name Apostolic Faith Movement and its periodical continued the name and enumeration of Parham's periodical, The Apostolic Faith. In late 1910 or 1911, this group changed its name to Church of God in Christ. In 1911 or 1912, Bell changed the name of the periodical to Word and Witness. 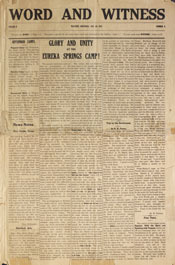 In the December 20, 1913 issue of Word and Witness, Bell published "the call" to Hot Springs, Arkansas, which was an open invitation for Pentecostal ministers to attend the April 1914 founding convention of the Assemblies of God USA. Delegates at the first general council elected Bell to serve as chairman, and Word and Witness became one of two official periodicals of the Assemblies of God (along with the Christian Evangel [later renamed Weekly Evangel; now Pentecostal Evangel]). Word and Witness merged into the Weekly Evangel on January 1, 1916. Only about half of the issues of Word and Witness have been located. If you are aware of the location of missing issues of Word and Witness, please contact the Flower Pentecostal Heritage Center at archives@ag.org.